BJP won the Kanpur, Bareilly-Moradabad and GorakhpurFaizabad MLC graduate constituencies, the results of which were declared today. 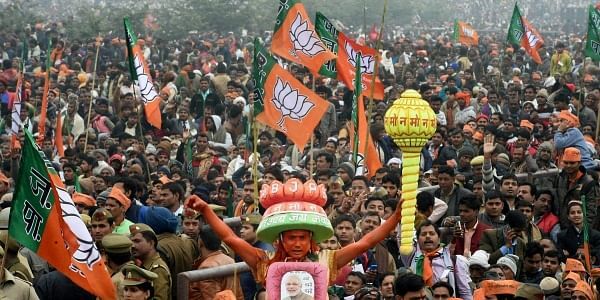 NEW DELHI: BJP today won three graduate constituencies in the Legislative Council elections in Uttar Pradesh, with Prime Minister Narendra Modi terming it an indication of things to come in the state. Expressing happiness over the results, Modi said in Badaun, "This is an indication of things to come." "In one month's time new government will be formed in the state...things have started to change with the MLC results, of which three have gone in favour of BJP...had BJP lost it would have been breaking news in the media," he said, adding that it shows how strong the wave is in favour of BJP. Information and Broadcasting Minister M Venkaiah Naidu said he was "extremely happy at the resounding victory" of the BJP candidates in three MLC graduates constituencies. "It is a clear indication of the mood of the people and I am sure that the same trend will be reflected in the ongoing Assembly elections all over that state," he said. While Jaipal Singh Vyasth retained the Bareilly-Moradabad constituency with a majority of 25,000 votes, Arun Pathak won the Kanpur MLC constituency by a margin of 9,000 votes. The Gorakhpur-Faizabad seat was wrested from SP by Devendra Pratap Singh. Pathak credited his victory to the party's policies and development work. Naidu said the victory reflects the "overwhelming popularity" of the Prime Minister and the support of the people for his drive against corruption and black money through demonetisation. "It is also a clear endorsement of various pro-poor, pro farmer and pro-women welfare schemes and other developmental initiatives launched by the NDA government during the last two-and-half-years," he said. Congratulating the three victorious BJP candidates, Naidu said, "I'm sure this would create a positive impact in the rest of Uttar Pradesh where people are fed up with the misrule of Samajwadi Party." "Despite its desperate, last-minute alliance with Congress, the people in that state will clearly reject this opportunistic combination and support BJP for the all-round development of Uttar Pradesh," he added. Polling for the Legislative Council seats from graduates constituency was held on February 3. Counting began yesterday and concluded this morning.